The Bamboo Project: Let's Celebrate Beth's 51st Birthday with Your $10 Contribution! Friday is Beth Kanter's 51st birthday and the best way we can help her celebrate is with a $10 contribution to the Sharing Foundation through America's Giving Challenge. Remember, the top four causes will get $50,000 and I'm pleased to report that with your help, the Sharing Foundation is number three on the Leader Board! Now what we're looking to do is help Beth get 51 new donors to give $10 by Friday, which will give us a huge boost and put us within striking distance of the number two spot. If you want to help out, just click on the America's Giving Challenge widget in the sidebar or visit the fundraiser here. Let's help Beth have a happy birthday. And if that cute photo doesn't convince you, then I think that this recruitment video will do the trick! Thanks so much! I think you picked one of my favorite photos! The video is something that Harry and I did in our continued exploration of making media together. 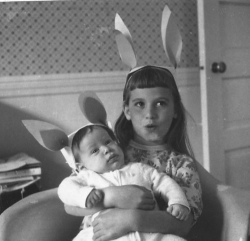 Beth, that is THE cutest picture--I love the bunny ears. Tell Harry that I think he has a career in media ahead of him. He definitely seems to have a knack for it! Sitting here in San Diego and trying to thank everyone .. I am awestruck by the generosity of all this. I bop to different communities I've been participating and all of them have given or participated. I'm mulling something to write about reciprocity .. can't even spell it.